I remember sharing a bedroom with my younger brother and sister when we were very young. On the wall was a poster of Bruegel’s Children’s Games. We used to talk about which child we were. My sister was the little girl in white with the blue headscarf and I was the one looking after her. My brother would be a different boisterous boy every time. It was the first painting I knew really well and I never got tired of looking at it. Until I went to the Bruegel exhibition in Bath recently I hadn’t realised there was more than one artist. It turns out there was a whole dynasty of them and they had a studio where they reused cartoons and made different versions of popular themes. 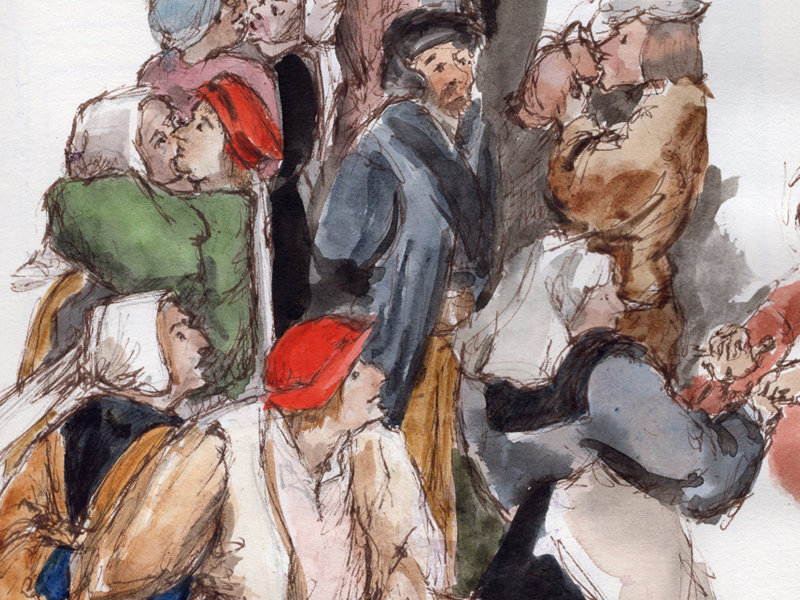 As I sketched the Wedding Dance in the Open Air by Pieter Brueghel the Younger, I wondered how he captured the movement of the figures dancing? No photography back then. I overheard an attendant telling a visitor that his father, Pieter Bruegel the Elder, went in disguise to peasant festivals to observe them. Did he ask the dancers to ‘hold it there for a moment while I make a quick sketch?’ Recent conservation of this painting showed it was a copy of a painting by the Elder Bruegel, who also painted Children’s Games. They clearly had no qualms about recycling a good image. Spending time studying it I also realised that many of the faces had the same characteristics. Was this because a few models had been used throughout? Or was it because the gene pool was limited? I found myself thinking that the chap downing a large jug of ale reminded me of someone (better not say who). Spending time sketching a painting, like having one on your bedroom wall, allows you time to absorb it properly. The exhibition continues at the Holburne Museum in Bath until 4th June 2017. It is well worth a visit to see the glimpses of real life four hundred years ago and the astounding details. I could have spent a week there without a dull moment.